Happy ANYTHING GOES with Tiddly Inks!!! This is Molly's Cup of Love! How many times have you bonded with a dear friend over a Cup of Coffee? Hot chocolate? A good meal? Those moments when we actually sit down beside each other, or across from each other, or diagonal even, those are precious times!!! Last night I was HONORED to have a friend call me up needing some advice on politeness. You see, she had sort of lead someone to believe she may be able to meet up when in fact, circumstances had changed and she was no longer interested. So, I said, "Just say, listen b****, lol, nope." And that was that. Haha. Only half kidding. Being in a situation in which you have to reject someone is not fun, but often necessary. It makes me think of that song, "You gotta be cruel to be kind". And if someone feels they are wasting their time being in my presence, shoo fly shoo! Life is SO SHORT, and having friends and loved ones you enjoy being around is the place to be! Sure, sometimes you might have to hang out with less desirable options but if there's a choice, be where the love is! Feel free to join in our Anything Goes Challenge where EVERYONE IS WELCOME TO PLAY!!!! Provided, of course, you use a Tiddly Ink Image and a new make! Molly's Treat is just to sweet, from her pink hair down to her sparkly-shoe covered feet! She is the perfect little image for an ANYTHING GOES challenge this week!!!! 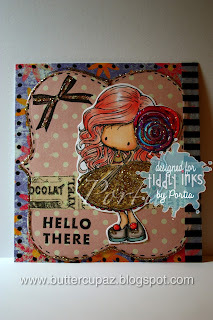 You are more than welcomed to join us at the Tiddly Challenge Blog which is to create ANY new make using a Tiddly Ink's Image!!! There are many to choose on so Happy Tiddlying!!!! Splish splash! *Bubble* *Bubble* Swim Swim! Is it reading time? Is it swimming time? With this bookmark, you could do both! Or maybe just IMAGINE doing both! Yeah, that's the ticket! This little bookmark featuring Amy and Her Mini Mermaid Friends is such a cute, quick project to put together! With a couple pieces of washi tape, some stickles and some fun black marker designs, this baby is ready to gift into a book or to use for my own self! Oh yes! I would love to be swimming now but this mermaid has rehearsal tonight honey! Yep yep! I hope your night is full of the perfect amount of swimming! Even if that just means taking a shower, it counts! Us mermaids need our water! I hope this project reminds me that there are no gifts too small for the gifting! 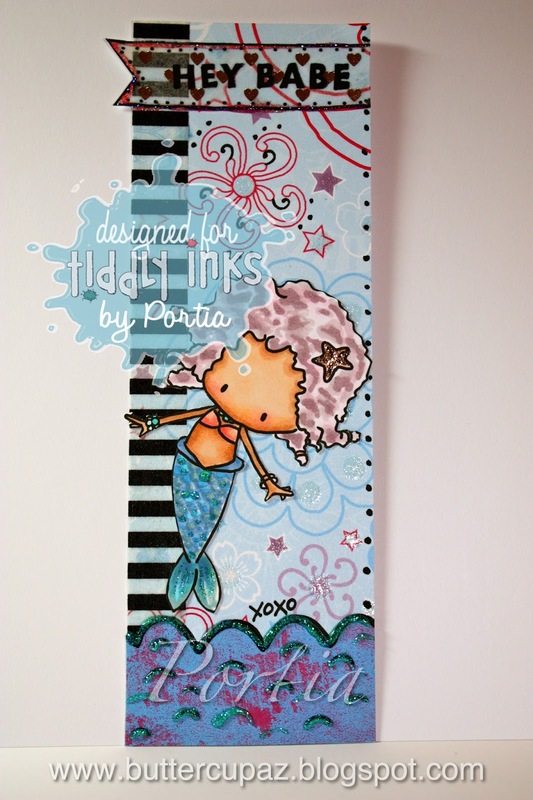 Bookmarks are cute and functional! Happy Fabby Friday with Molly! It's Molly! She is a fashionista who is ready to take on the world! Don't you just love hats and wish you wore them more? I do! Hats make me think of horse races, my cowboy of a Grandpa (may he rest in peace), and sports! They can be FANCY or CASUAL! Functional or fashionable! Sometimes both! I might not have many occasions to wear such fancy hats, but Molly here sure does! I bet she is on her way to pet an peacock, pick out pretty jewels or teach some neighborhood kids geography! Doesn't she look sharp and fancy? This little card is for our Fabby Friday at Tiddly Inks! It's an attempt to inspire you to create something, very possibly with Tiddly Inks digis! 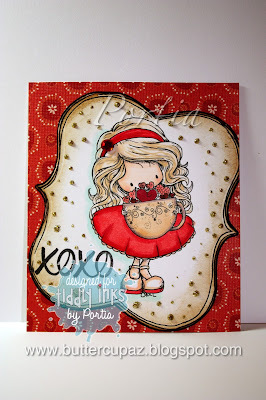 Christy's images are so fun to color up and can be used for so many occasions! I would love to stay and chat but it has been a doozy of a week and I am plum-tuckered out. Thank You so much for blogging by and checking out this little Molly make here!